The Ontario Superior Court of Justice recently ruled that in order to claim damages for lost luggage under the Convention for the Unification of Certain Rules for International Carriage by Air, signed at Montreal on 28 May 1999 (the Montreal Convention), a passenger need not have personally checked the luggage. This decision partially affirms a decision of the province's Small Claims Court, where the deputy judge held that, despite only one passenger in a group having checked in all of the bags, each passenger had been entitled to claim damages for the loss of the luggage. One of the plaintiffs, Seyed Nader Emamian Naeini, checked each of his family member's bags at the counter in Miami and obtained luggage tags in his name. When the plaintiffs arrived in Toronto, five pieces of luggage were missing. Only one of the five missing pieces of luggage was subsequently delivered to the plaintiffs. The plaintiffs filed a luggage declaration of loss form, setting out their losses in the amount of C$6,800. This included the loss of four pieces of luggage and their contents (ie, one piece of luggage per family member). The plaintiffs also asserted a claim for the costs incurred while attempting to find the lost luggage and punitive damages. At trial, the plaintiffs conceded that the Montreal Convention applied to their claim. The Montreal Convention governs the rights and obligations of parties to a contract for international carriage by air, including claims relating to lost luggage. In the case of lost luggage, Article 22 of the Montreal Convention limits a carrier's liability to 1,131 special drawing rights unless the passenger has made a special declaration of interest in delivery at destination setting out the luggage's value. applies only to the passenger holding checked baggage tags irrespective of whether the checked pieces belong to him or others or a combination of both… or applies to each passenger with baggage whether checked by him or her in his/her name or not, or unchecked. The deputy judge held that the liability limit "applies to each owner of baggage, whether checked by him/her or not, or unchecked". The deputy judge also held that, even if the right to reimbursement under the Montreal Convention applies only to the passenger holding the checked luggage tags, as Air Canada argued, he would hold that the other members of the Naeini family had held luggage tags beneficially in their own names "as beneficiaries of the claims held by [Naeini] in trust for them". The deputy judge then awarded the maximum compensation in special drawing rights, which was equal to approximately C$2,160 for each of the four passengers. This amount was awarded despite the plaintiffs only entering claims for a total of C$6,800 on the lost luggage declaration form. the judge had erred in awarding each plaintiff the maximum compensation based on a global list of all of the contents of their checked luggage without considering the damages that each respondent had actually incurred. Justice Wilton-Siegel of the Ontario Superior Court of Justice upheld the deputy judge's decision with respect to the question of whether each passenger was entitled to claim compensation for lost luggage under the Montreal Convention. [T]he Convention does not stipulate that a passenger must physically hand over his or her bag, being the bag in which his or her personal effects are packed, in order to assert a claim. Nor does the Convention provide that a passenger must obtain a luggage tag in the passenger's name in order to qualify as a passenger who checked baggage. In short, a passenger having a claim for lost baggage for the purposes of these sections is simply a passenger who can establish as a factual matter that he or she checked a bag containing his or her belongings which was lost while under the control of the carrier. The court noted that, "as an evidentiary matter, it is far more significant that [Air Canada's] representative did not treat all of the bags as belonging to Naeini, as evidenced by the fact that he was not charged extra baggage fees". As such, Wilton-Siegel held that Article 22(2) of the Montreal Convention effectively permits a claim by each passenger who can demonstrate that their bag was handed to the carrier and was checked by the carrier, regardless of whose name is set out on the luggage tag. However, Wilton-Siegel held that the damages should be reduced to the amount initially claimed by the plaintiffs on their luggage declaration form (C$6,800). Wilton-Siegel found that the deputy judge had no basis for awarding more than this amount, given that there was no evidence before the deputy judge that the lost items' value had been understated on the lost luggage declaration form. Moreover, the other claims advanced by the plaintiffs – including the costs of attempting to track down the lost luggage as well as punitive damages – were found not to be compensable under Article 29 of the Montreal Convention. Air carriers should be aware that liability for the loss of checked bags will not necessarily be limited to the passengers named on the luggage tags. Rather, each passenger who can establish that a bag containing their belongings was lost while under the control of the carrier will trigger a fresh liability limit for lost or damaged bags. For further information on this topic please contact Carlos P Martins or Emma Romano at Bersenas Jacobsen Chouest Thomson Blackburn LLP by telephone (+1 416 982 3800) or email (cmartins@lexcanada.com or eromano@lexcanada.com). 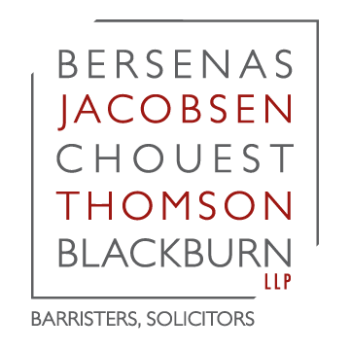 The Bersenas Jacobsen Chouest Thomson Blackburn website can be accessed at www.lexcanada.com. (1) Naeini v Air Canada, 2019 ONSC 1213.